The young man was approached by an old warrior. "What will you do to escape my power?" asked the old warrior. "Nothing," replied the young man. What is written here may at first seem difficult to understand. That's because it's probably new to you and like anything new it takes time and effort to absorb. 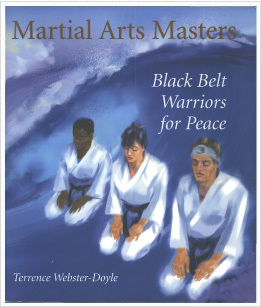 If you are serious and want to study the martial arts to be a Black Belt Warrior for Peace then you will have to practice. Learning the martial arts takes time. But if you keep at it, one day you will completely understand what is being said here. As you come to understand, your life will change for the better. This is because the martial arts that are for peace are meant to help you in your everyday life—to resolve conflict, to build character, and to create peace.